Alcohol inks are among the most trending art materials and are incredibly fun to play with in all sorts of projects. Create unique designs on slick, non-porous surfaces such as tiles, jewelry, glossy papers, metal, glass, and more. (Try pairing them with shaving cream to make mesmerizing marbled effects!) Alcohol ink mixatives can also be used to give your colors a metallic sheen. These inks are easily blendable with rubbing alcohol or alcohol ink blending solutions. Apply several drops onto your surface either before or after applying your inks and watch the magic happen as they mix! Blenders can also be added with other tools for more patterned looks, or try blender ("eraser") pens for drawing or lettering over your inks. Alcohol inks are dye-based, which allows them to have a variety of brilliant colors. This also means however that they are not the most lightfast. Keep artwork out of direct sunlight or seal with a UV-resistant topcoat to protect your ink art from fading. **Caution: While alcohol inks are simple to use, they are not recommended for children due to the alcohol-based content of the ink. Do not use with spray misters or other tools that may put particles in the air as they are harmful to get in your eyes, nose, or mouth. Use in well-ventilated areas and keep away from heat and flame. 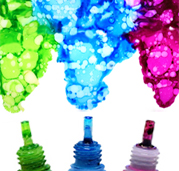 Alcohol inks may stain porous surfaces such as clothing, wood tables, etc.